Embark on an off-the-beaten-track walking tour through this fascinating island nation and discover its people, society and culture. Japan is known as one of the top gourmet destinations in the world. The Izu Geo Trail and Hokkaido Hike will reveal some of the country’s culinary delights at authentic Japanese restaurants, washed down with local sake. The Izu Peninsula showcases some of the freshest seafood available, from spider crab to squid, lobster, sea bream and much more, while Hokkaido’s famous scallops are world-renowned. For those looking to unplug and unwind, Walk Japan’s Kunisaki Retreat will provide a much-needed respite from bustling city life. Nestled in the western end of Japan’s Seto Inland Sea, modern Japan has left this quiet haven of rural life largely untouched. Days will start with calming meditation and yoga sessions, followed by relaxation in onsen thermal hot springs, soba buckwheat noodle master classes, ikebana flower arranging, chado tea ceremonies and Japanese taiko drumming. From snowcapped mountains and pristine forests on the Snow Country Trek, to picturesque old post towns and seasonal Cherry Blossoms on the Nakasendo Way. History, culture and literature lead guests through Walk Japan’s unique Basho Tour: Narrow Road to the North, which follows in the footsteps of 17th Century Japanese poet, Matsuo Basho. 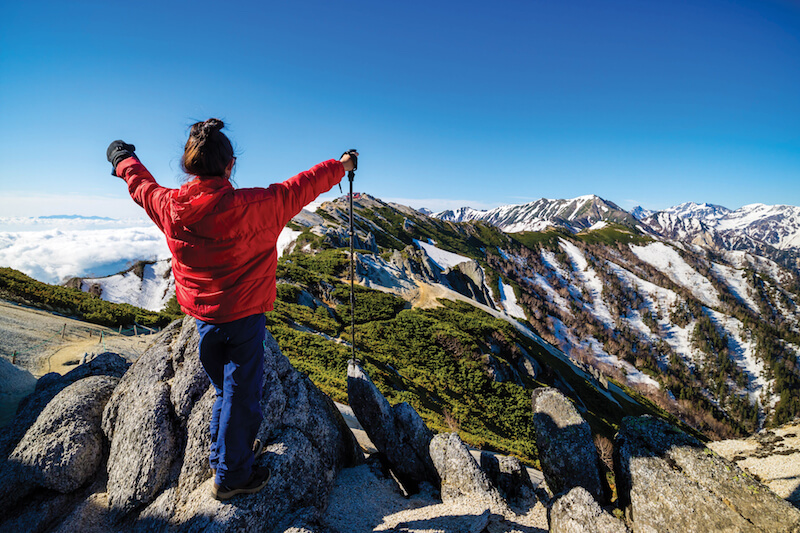 While travelling along quiet country lanes, forest trails and mountain footpaths, you’ll learn of the history and tough spirit of the people of Japan’s northerly regions. As well as revealing remote rural hideaways, walking enables encounters with a range of enchanting personalities, offering insights into local societies and traditions. Discover the secret to the Okinawan people’s longevity and hear the riveting life stories from local craftsmen and fishermen in the Okinawa Voyage, while the Kunisaki retreat includes meditation led by the abbot-in-waiting of Fuki-ji. Walk Japan penetrates the back streets of Tokyo and Kyoto on city tours that uncover more about the history and culture of the fascinating cities than any other tour or guide book. Walk Japan is dedicated to leaving a positive impact on all areas that their tours touch upon. In addition to supporting family-run and local businesses, Walk Japan established a Community Project in Kunisaki to preserve the environment and provide a prosperous future through farming and reforestation initiatives. 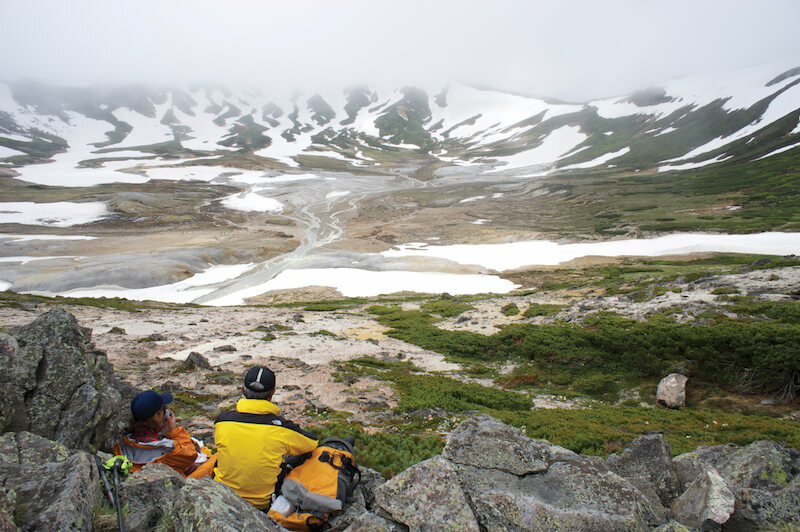 The project employs local residents and offers Walk Japan employees and guests the opportunity to partake at the end of each Kunisaki Retreat or Trek. For those looking to up the adventure anti, the Yaeyama: Okinawa Voyage goes beyond walking to include kayaking across rivers, mangroves and the open sea as well as snorkelling the coral reefs. Ishigaki’s aquatic paradise is home to over 300 species of tropical fish and, with a bit of luck, guests may catch a glimpse of the beautiful sea turtles as they make their way from the beaches to the open sea. 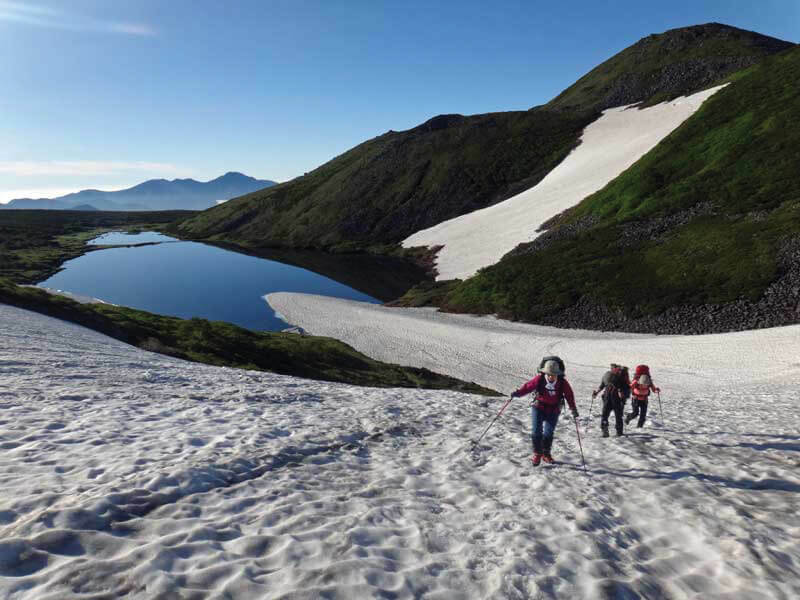 Those looking for the challenge of higher altitudes can trek some of Hokkaido’s highest mountains on the Hokkaido Hike, including Mt. Asahidake, Mt. Tokachidake and nearby volcanoes. Walk Japan’s Tour guides are experts in Japanese culture, food and geography. All guides are proficient in both Japanese and English and have an intimate knowledge of Japan and its people. The ranks of Walk Japan’s Tour Leaders include individuals who have extensive experience across the media, agriculture, commerce, arts, finance, academia and tourism sectors in Japan. For those looking to travel solo, the Wayfarer self-guided tours of Kumano and Nakasendo are an incredible way to immerse in the Japanese countryside. Drawing on the wealth of experience and knowledge amassed by Walk Japan, each guest is provided with the essential logistics and route support along with a Route Booklet covering a mix of historical relevance and modern cultural know-how for entirely independent touring of the roads less travelled in Japan. The company leads the way in providing the most fulfilling and enjoyable tours available in Japan. Walk Japan has an unrivalled range of regular, scheduled tours for Japan and is researching more for the future. It also creates and runs private, custom tours tailored to customers’ particular interests and requirements. These include private tours for families, friends, societies, companies and schools. Founded in 1992 by two academics, Dr. Thomas Stanley and Prof. Richard Irving, the company has since grown considerably both in its number of tours and customers to become the acknowledged leader of specialised tours that immerse visitors in Japanese society and culture; provide great insights into the nation and its people; and often explore little-visited, beautiful and diverse regions of the nation. Detailed information about all of Walk Japan’s tours can be found on their website (www.walkjapan.com/all-tours) and on the Walk Japan Facebook page (www.facebook.com/walkjapan). All of Walk Japan’s tours have developed into adventures in beautiful and interesting areas, and given the country’s length (stretching some 3,000km north to south), together with its mountainous terrain, the arrival of the seasons and their length varies greatly according to region and climate, from sub-arctic in the north to sub-tropical in the south. January is the perfect time to enjoy Hokkaido’s wonderful winter landscape. The Hokkaido Snow Tour is a snowshoe tour through Hokkaido’s less-visited snowy east, with the opportunity to walk over pristine snow, spot abundant wildlife and survey crater lakes shimmering in the crystal-clear air. Spend the evenings in delightful traditional accommodation, whilst warming up in onsen (hot spring) baths. February is the ideal time to combine the winter landscape of Tohoku in north Honshu, with warm, invigorating onsen (hot springs). The region is famed for its beautiful and rugged landscapes. The Tohoku Hot Spring Snow Tour is a 9-day, 8-night tour using snowshoes to explore this mysterious land – including a visit to a spectacularly sited temple high above a valley on a steep cliff. Look out for the phantasmagoric juhyou snow monsters which dominate the slopes. The Izu Peninsula is one of the most unique geological areas on the planet. Although only 150km from Tokyo, Izu, with its distinctly different landscape and climate akin to a sub-tropical island, is a world away from the capital. The Izu Geo Trail tours through this spectacular geological park and has a wealth of interest including amazing rock formations, beaches, waterfalls, literature and history. Beautifully located inns, bountiful seafood and onsen hot spring baths make this 7-day, 6-night tour a real treat. April is a delightful time to visit Kyoto, the enchanting cultural capital of Japan. This 2-day tour takes participants through the city’s rich history – a unique look into Japan’s old capital, its history, arts, crafts and people. April is also prime time to view Japan’s famous Sakura, or Cherry Blossom. Weather-dependent and notoriously fickle, peak bloom lasts only a scant few days, and usually bloom between the last week in March and first two weeks in April. Shikoku is a sparsely populated and beautiful, rural region. 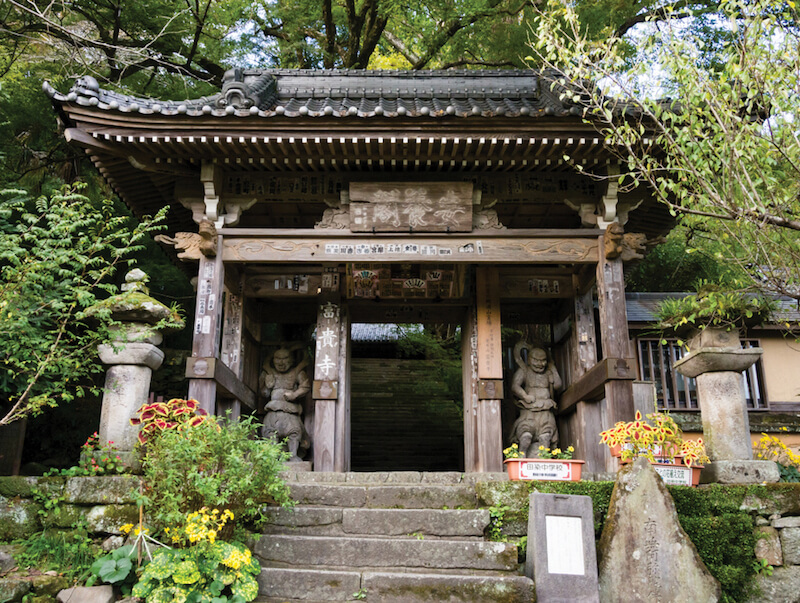 Spring is a wonderful time to do the Shikoku Temple Pilgrimage, which traverses part of the ancient 1,200km Shikoku 88 Temple Pilgrimage linking the famed 88 temples on Shikoku. The route begins in Tokushima, on the Pacific coast, before travelling through the rural heart of Shikoku’s mountainous interior towards Takamatsu on the placid Seto Inland Sea. Accommodation includes pilgrims lodgings. Tour priced from JPY 524,000pp. June takes us to the lovely countryside of the Kunisaki Peninsula on Kyushu, Japan’s most westerly main island. Little developed, Kunisaki is dotted with sleepy hamlets, covered in verdant forests and paddy fields. On this 7-day, 6-night Kunisaki Retreat you’ll experience Walk Japan’s version of a spa holiday – a mind and body tour in warm, serene surroundings. Yoga, meditation and gentle walks through rural scenery, accommodation in family-run inns, delicious healthy cuisine and restorative onsen hot spring baths. Bliss! As the mercury rises, the north of Japan becomes an idyllic summer paradise. 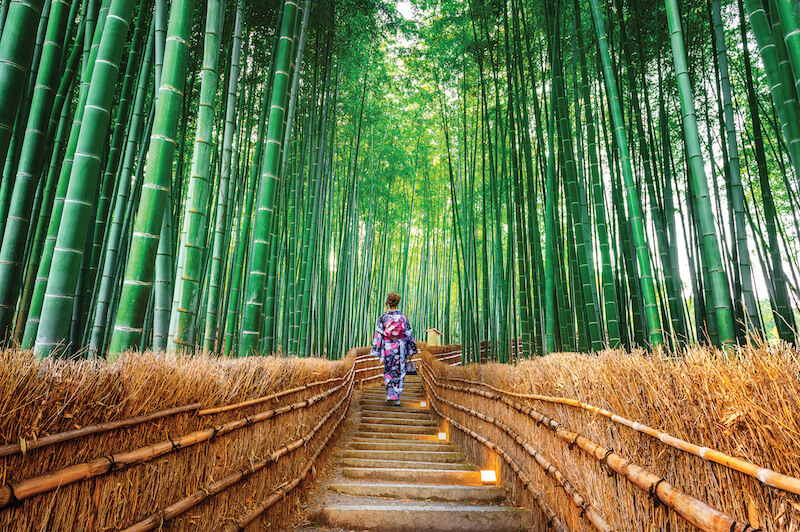 Head to beautiful Tohoku to the Sea of Japan and take delight and inspiration from some of the greatest scenery to be found in Japan, including pine-clad Matsushima and the beautiful gardens found at Hiraizumi and Kenroku-en. The Basho Tour is a 9-day, 8-night guided journey through quiet country lanes, forest trails and mountain footpaths including accommodation in Shinto shrines and traditional inns. Temperatures and humidity are high in August, so Walk Japan have specially adapted their popular Nakasendo Way tour for the summer months. Their 8-day, 7-night Summer Nakasendo Way tour visits areas at higher altitudes and is designed to provide a comfortable walking experience in summer, exploring the best verdant sections of one of Japan’s ancient highways, the Nakasendo; the lovely Kaida Plateau; and Matsumoto, a delightful regional city dominated by its castle. The porters and pack animals of ages past no longer exist, so Walk Japan uses modern means to send main luggage ahead so walkers can travel light. Japan’s Kii peninsula is an area with abundant waterfalls, lush forests and a plethora of beautiful rivers. The 9-day, 8-night Kumano Kodo Pilgrimage is a tour between the modern, vibrant city of Osaka, the mountain temple community of Koyasan and the Japanese Imperial shrine at Ise. The walk is centred on the Kumano Kodo UNESCO-registered pilgrimage, one of only two UNESCO World Heritage listed pilgrimages (the other is the Camino de Santiago in Spain). The route offers plenty of places to enjoy the magnificent foliage of the autumn leaves, the second seasonal show by mother nature to impact the tourist calendar. Autumn is a good time to visit Tokyo, one of the greatest, most enigmatic cities in the world. 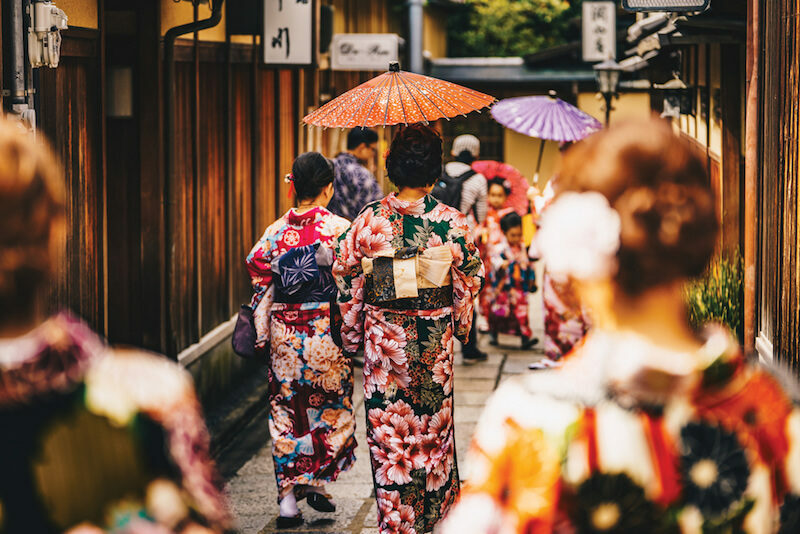 Walk Japan offers a guided walk through the cityscape and delves into Tokyo’s fascinating history, from founding shogun to today’s glittering metropolis. Find remnants of and insights into samurai Edo amongst gleaming architecture in one of the safest, most intriguing cities in the world. The Tokaido is the greatest of Japan’s ancient highways, linking three of its greatest cities: Tokyo, Nagoya and Kyoto. Journey through the very core of Japan’s history, culture and society on this 8-day, 7-night tour taking in quiet roads and forest trails climbing over hill passes. The Tokaido Shinkansen bullet train thunders between Tokyo and Kyoto in a little over two hours – this tour instead takes 8 days, connecting the best sections of the Tokaido through towns and paths seemingly forgotten since the days of the samurai. The Japanese treasure their natural Onsen hot spring baths, and what better time to enjoy a trip linking hot spring to hot spring in charming rural Oita than in cold December. The Oita Hot Springs Tour is a gentle walking and cycling trail through varied terrain – gorgeous valleys, a pretty plateau, soaring mountain scenery and seaside. Various onsen hot spring baths derived from volcanic activity deep below the earth’s surface link the trail together, each with different characteristics – some clear and some murky, some pungent and some fizzy! Oita is undoubtedly the Onsen capital of Japan, if not the world.